Do you have a class artist? This would be the student who spends more time doodling in the margins than writing his or her spelling words, volunteers for any and all classroom decorating projects, wins the poster contest, and often is bored and distracted during classes that don’t relate to art. That was me, a long time ago. Being the class artist was an honor. I felt like I had a talent that people recognized and I loved the praise and attention. What could be wrong with that? Looking back, I now see a few problems that might be worth considering. First of all, other kids might feel their work isn’t good because of all the attention given to one or a few students. They might even tend to copy the work of the class artist and aspire to be like them, rather than have the inspiration and confidence to do their own thing even if it’s different, or not “good art” as others perceive good art to be. Another problem is that the label of class artist can put a mindset in the child at a very early age. She might focus her sights on being an artist because everyone says she should! Her other interests can become secondary or even, as in my case, hated drudgery. And, perhaps she is an amazing realistic portrait artist. So much attention is given to her skill at portraiture that she may never try other styles or media. She could be stifled and unable to grow as an artist. We don’t want that to happen, and we also don’t want any awesome talent to be permanently squashed because so much attention is given to one or a few students who appear to exhibit more skill than their peers, at anything. Of course, many kids will show aptitude in a particular skill. Whether people are “born with” distinct abilities or if more of it comes from nurturing, practice, and/or environment, or more likely a combination of these factors, we certainly don’t want to ignore talent when we see it. But the school curriculum is generally designed to give kids a well-rounded education, providing (as best we can) lots of chances to experience the many possible life paths out there in the world. We want to encourage students to discover and pursue their dreams, but it’s hard not to pick out those kids who obviously excel in one particular skill. Artists who aren’t fond of writing can write a story using pictographs, and then let other students try to decode it. They can start with a known story, then you can see if they decide to try picture-writing something original! A student who would rather doodle than pay attention to U.S. History can illustrate a timetable that shows what happened during the industrial revolution, the Civil War, or other event, with help from the history buffs in the class. Artistically inclined kids who are bored with science can learn about it through drawing, i.e. animal anatomy, the workings of a jet engine, the water cycle. They can work with other science students to contribute to a project rather than be set apart for their talent. An artist who isn’t all that interested in math can be encouraged to use his or her artistic skill to complete assignments, i.e. illustrating a story problem as a painting or poster design. Kids who especially love to sculpt can illustrate math problems using three-dimensional art. An artist can use his or her talent to work with other kids who struggle with math. Artists who hate sports can be encouraged to practice life-drawing during team play. He or she might also be “hired” to create portraits of the players that can be displayed to honor their achievements in the game. 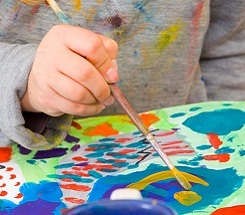 When special talents are incorporated in the classroom rather than set apart, it exposes the class artists to some of the possibilities that their art can open up, introduces them to other subjects in ways they can relate to, keeps them included in the group, and can possibly encourage some “non-artists” to create art as it pertains to their own favorite subject. It can also foster appreciation of their talent, rather than jealousy. I confess. I look back now and wonder where my career would have led me had I not been so strongly encouraged to follow a particular path. All I know is that it took about 40 years to figure out that I could be good at other things, too.